Day two of my Fashion Week posts. 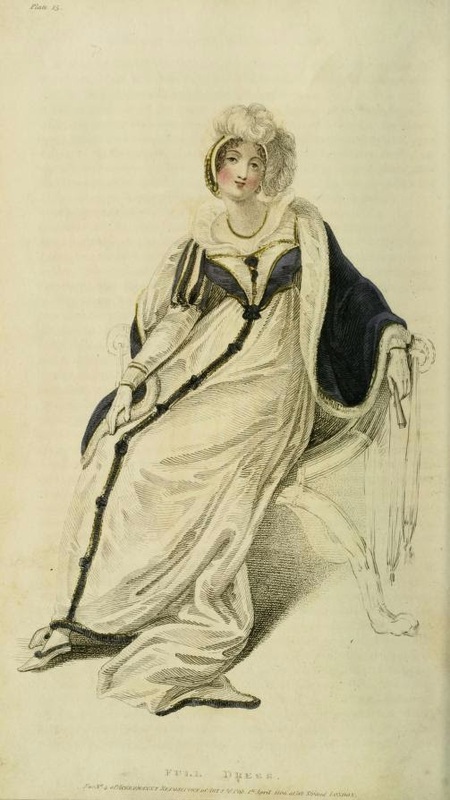 Today’s post is the Fashion Plates from the April 1809 edition of Ackermann’s Repository. White satin dress, with purple body, and long sleeves slashed at the top; bows of purple ribbon down the front. Mantle of purple, lined with white silk, bordered with gold, and edged with swandown. Gold net cap with white feathers. White shoes, gloves, and fan. Necklace, ear-rings, and other ornaments, of gold. 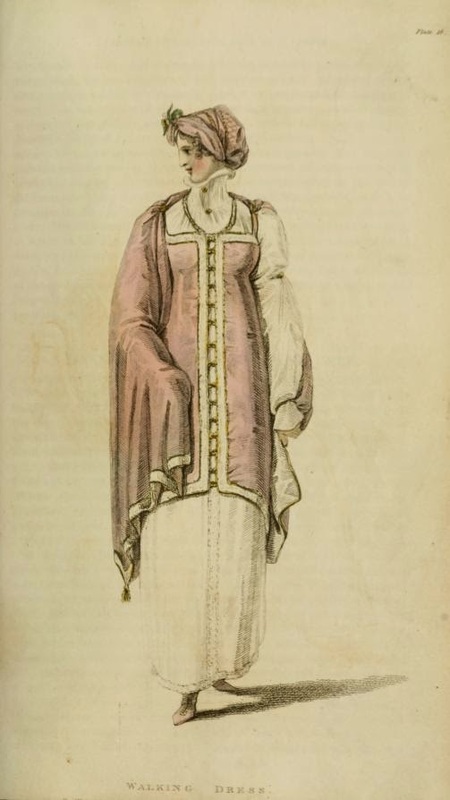 A tunic of lilac silk, clasped down the front with gold ornaments; a cloak of the same colour attached, so as to untie closely behind, but to fall loose over the shoulders; fixed on the shoulders with golden ornaments; the cloak is lined with white or straw- coloured silk, and ornamented with a border of gold. Bonnet and boots of the same colour. Raised spotted muslin under-dress, with loose sleeves, bound at the arms and wrist. Gold necklace, and York tan gloves. Red cloaks are at length completely abandoned, and we congratulate our lovely readers on their emancipation from the most despotic dress the ever was introduced by the whimsical and arbitrary goddess of fashion. The writer of this article predicted, on their first appearance, that a colour so disadvantageous, to beauty, could never become prevalent. “Let them,” said he, “enwrap themselves with immense blaze of red, it will come to nothing at last.” And so it has turned out: our promenades presented us with an assemblage of pallid and ghastly spectres, who, though “forbidden to tell the secrets of their prison-house,” carried about with them the visible signs to torture, and appeared literally robed in flame. Pea-green is a colour generally introduced in spring, for what reason we know not, except it be intended to harmonize with the verdure with which, at this season, all nature is beginning to be clothed, through some may doubt whether a notion of harmony ever entered the inventive brain of a fashionable dress-maker. However this may be, we must enter our decided protest against it; and we entreat our fair readers not to adopt a colour so directly in opposition to good tast, and in which no face or form, be it majestic as Juno, or beautiful as Hebe, can ever appear with advantage and effect. Lilac, purple, all the varieties of grey, are open to their choice. If green must be selected, let it be the deep and rich hue of the Spanish fly, rather than that worst and vilest of all colours pea-green. Mr. Adair’s treaty with the Sublime Porte will doubtless introduce amongst our spring fashion a profusion of Turkish turbans, Janizary jackets, mosque slippers, and a thousand similar whimsicalities; all of which (provided a northern coalition be accomplished) must speedily give way to Russian cloaks, hussar caps, Cossack mantles, Danish robes, &c. &c. So that by the setting in of the dog-days, our ladies will stand a chance of being arrayed in the complete costume of all the shivering nations of the north. Such is the capricious system introduced and acted upon in the empire of the despotic goddess of fashion! When shall the dress of the British fair be established upon the simple and unerring principles of nature; and when shal those principles be adopted as the barometer of good taste? We have not the vanity to promise ourselves the complete accomplishment of those objects, but to that end all our endeavours shall be directed. Nothing shall appear in our pages but what is strictly compatible with good taste, so that while we discover and expose errors, we will not be wanting in our endeavours to point out the remedy. The prevailing colours for both dress and morning coats, are dark blue, olive, and bottle green, with silver and gilt basket buttons; long waist and short skirt; but upon the whole, the fashionable coat is very short, and must not come lower than within four inches of the knee. The lapels are rather long, and come even with the hip buttons. The collar is made high, thinly padded, and to fall back two inches. The dress coat has round cuffs without buttons, with pockets under flaps: the morning coat; sleeves with slits, and three large buttons. The sleeves are worn very long. The waistcoat is single-breasted; flaps, with small regimental skirts; the collar within that coat: it is made of striped Marcella, of various shades, but buff colours ase most fashionable. Breeches, of a light drab colour, made rather long and tight. For pantaloons, the stuffs generally worn are double-milled stocking and Prince of Wales striped kerseymere.